There’s a feeling you get travelling to Splendour In The Grass. A hard shot of excitement that comes in bursts. Not talking about one of those ‘events’ you get dragged into. Or those other gigs you go only because you feel you should. This is different. It’s The One. Your eyes run across the lineup and there’s no question. You need to be there. Somehow you lock down a ticket. Landscape flashes by on the highway. You lose concentration for a moment and when you snap back you’ve arrived. Something’s in the air but you don’t know what just yet. Then again, who cares? You’ve made it. Finally. You’re HERE. Or maybe you aren’t. Either way, for the next three days – live and direct from the heart the Splendour In The Grass Nation – we’re here to give it to you, everything. Well, we can’t cover it all, but the hope is that these words will give you some of the feeling. Your own slice of that all-important vibration. All the fricking spills and the honest-to-god thrills. So here goes. Jack River isn’t the first act to play. Far from it. But her set feels like the most important. Sitting in on an interview with her earlier in the day provides insight into what Holly Rankin is about. She’s inspired by Tame Impala; Kevin Parker is her musical hero, both her idol and her ideal. But as her debut album’s title — Sugar Mountain — might suggest, she puts in across like Neil Young. Jagged, expressive and painfully real. This is the kind of performance that reminds you why you’re here. Holly is alight. Her voice aches, pulling you into a fog of low-level depression before hurling you to giddy peaks. She sings, strums rhythm guitar and has visions. Holly’s a mean lyricist too. There’s power in her words. As much as she can get away with it, her music is organic. It’s played from the heart. The totality of her performance projects all the emotional gravitas of pop without the plasticity. ‘Palo Alto’ and ‘Fool’s Gold’. Offt. Dial back a bit. West Thebarton open the festival. That’s a lie. The honour went to Kwame, but this Adelaide outfit are electric. Their debut album Different Beings Being Different is raw, but live its music is rawer still. Songs come ragged and slurred. What’s unequivocal is that she’s a down-to-the-brass Australian rock outfit and the crowd’s all for it. The band keeps knockin’ them out. ‘Stuck On You’ comes mid set. Cheers. This group has arrived. Full throttle. Talking backstage before the set, Shane and Simon seem easygoing, but maybe a little reserved. What they do share is it’s their fourth year here. According to the pair, they play every time there’s a new album and then there was that one year they were called in last-minute to replace Catfish and the Bottlemen. Onstage, they’re a different matter entirely. They leap headlong through a heavy set. It comes dominated with the music of Bloody Lovely. Murray Cook from The Wiggles turns up to help deliver ‘Like People’. By the time they’re closing in on the end, the group have drawn a teeming crowd. DZ seem intent on extracting every last bit of energy this audience has to give. Then they throw in a cover of AC/DC’s ‘Highway to Hell’ just for the heck of it – just to keep them burning. You had better believe Murray is still there too. Hysteria. 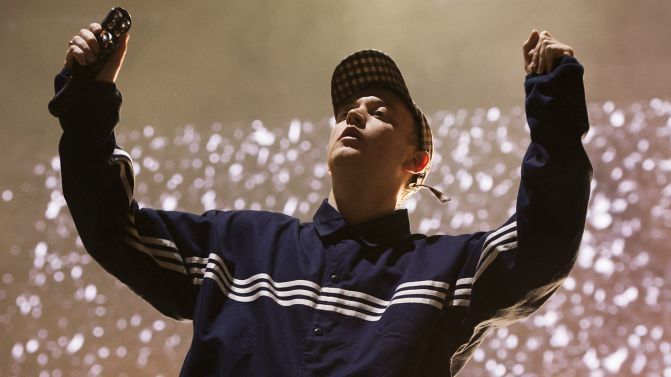 DMA’S don’t do small. Everything about this band is huge. They bring a spacious presence to the stage. It’s a huge set with plenty of expansive licks. Tonight, guitarist Johnny Took plays like The Edge. These three dream big. It’s on the rest of the world to meet them halfway. They’ve near-filled the amphitheatre. The crowd is overflowing. Its difficult to move. These onlookers stand a little motionless, almost as if they don’t know what to do with the band. It’s the ballads, songs like ‘In The Air’, which move them. They’re greeted with the greatest applause. That is until they revisit their famed Like A Version cover of Cher’s ‘Believe’. Thousands of voices follow along. Liam Gallagher occupied the exact same stage at last year’s Falls Festival. Just saying. Henry Rollins was on a #METOO panel earlier in the day. Picture it. One of the most outspoken men in the world of music on a panel like this. The expectation is that Rollins would dominate. But he just sat there and listened. He gets it. Of course, he did throw out a few of his thoughts here and there. But they must have been well-placed because word is Stella Donnelly thanked him just before it all wound up. She’d never heard a man in Australian music talk that way. She felt he was on point. Onstage, Rollins is different a beast. Or maybe not. The common thread is that this is a person who gives everything he has to what he does. It’s an approach to life at the core of his very being. He just doesn’t stop. Ever since a chance audition for Black Flag gave him licence to escape a dead-end existence, he’s thrown himself into every opportunity life’s presented. The guy’s relentless. Here at Splendour In The Grass, the man so perpetually on-fire does his thing. He talks stories. Henry surveys American presidents, recounts chewing a dead deer’s eyeball and then chronicles his relationship with RuPaul. There are plenty of laughs, but amidst it all is a message. He still believes in the American Dream, The Truth and a faith in words as well as science – reason. Pushing toward 60, Henry probably won’t make it to any forthcoming utopias. He’s given up hope of that, but he’ll sure as hell do his bit in clearing the way for the rest of us. The man can talk, but at the centre of it all is the notion that ideas are the most powerful weapon of all. His intensity catches the audience. You can’t help but absorb it. Everything heard about Lorde: 2013’s Splendour In The Grass was her debut. She replaced Frank Ocean, last minute. It was just as Pure Heroine was blowing up. For many, she’s this year’s marquee event. Live, it’s obvious she’s aware. Every phrase, every lyric, matters. She’s not wasting a note. Ella brushes off a wardrobe malfunction early set. She quips with the crowd. Now she’s covering Powderfinger’s ‘These Days’. It’s almost like she’s paying her dues, but the reaction to ‘Royals’ makes something clear. It’s this this 21-year-old’s own music that’s setting it all on fire. Where do you go when there’s nowhere left to go? Tipi Forest. Right now, it’s home to a thousand ravers. Pitiful souls who just can’t let the music stop. They’re out of their ever-loving minds. But aren’t we all? Paying respects to Australia’s first peoples at Welcome to Country. That poor soul who’s throwing their guts up at 3:54pm. Too much, too soon. Native American Indian headdresses. Still? The whole “Allan, Allen, Steve!” joke. It’s seven years past its used by date. Stop. A guy in a ‘Boogie Till You Drop’ tee.